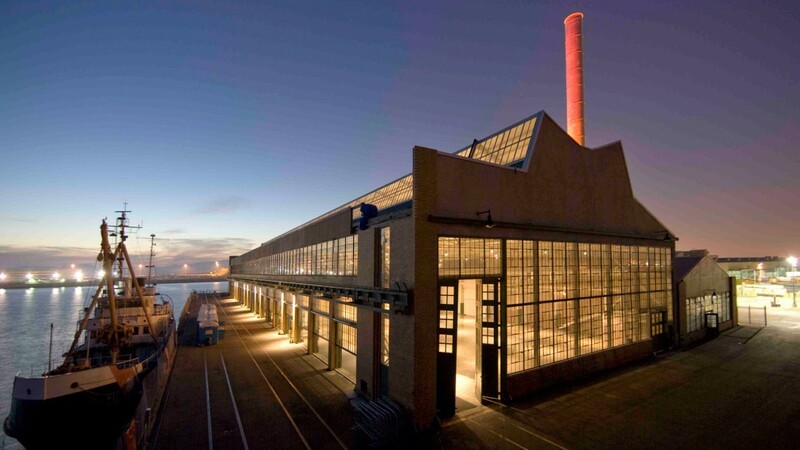 Craneway Pavilion in Richmond, California. The Codex International Book Fair is happening this February 8th through 11th at the Craneway Pavilion in Richmond, California. The first line of the press release reads, “Digital is dead, at least for one week this coming February.” Playing off of the myth that print is dead in the rise of the digital, Codex is the largest international book fair of its kind, housing over 200 participants, and is a growing entity expressly to promote the printed book as a thriving and recognized art form in and of itself. 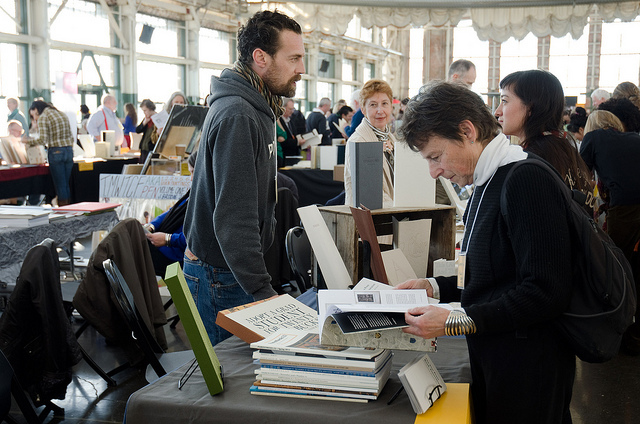 The fair includes a range of offerings, from small and large printmaking houses, master engravers, and illustration artists featuring artist made letterpress and hand bound books, materials, and supplies for book binding, independent press publications, and scholarly lectures from the United States, The Netherlands, Japan, South America, Mexico, and all over Europe, including Poland and Russia. 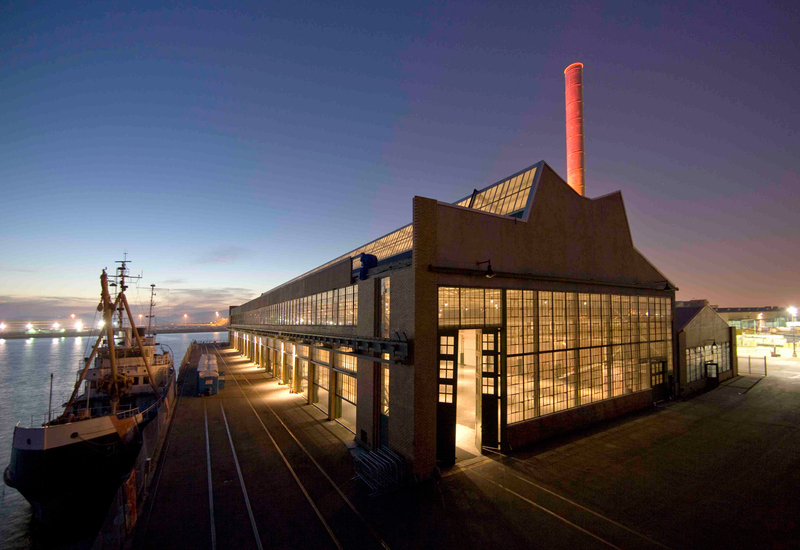 Some Bay Area participating galleries are KALA Art Institute, Jack Fischer Gallery, and selections from the Mills College Book Art Program. On New Year’s morning in 2005, Peter Koch awoke with a plan to start a foundation that would support artists, printers, and scholars who are passionate about the book as an art form. The concept was a unique one: a non-profit arts advocacy foundation specifically for fine printing and book arts, representing both San Francisco and global artists, printers and publishers. Hence, The Codex Foundation was formed. CODEX book fair installation. Courtesy of the Codex Foundation. Photograph by Karen Eng. The first and second biannual fairs took place in 2007 and 2009 and were held at the University of California, Berkeley. Now in its fifth iteration, book lovers will have to head to Richmond for the fair, but it will be well worth the jaunt up there if you are in other areas of the Bay. 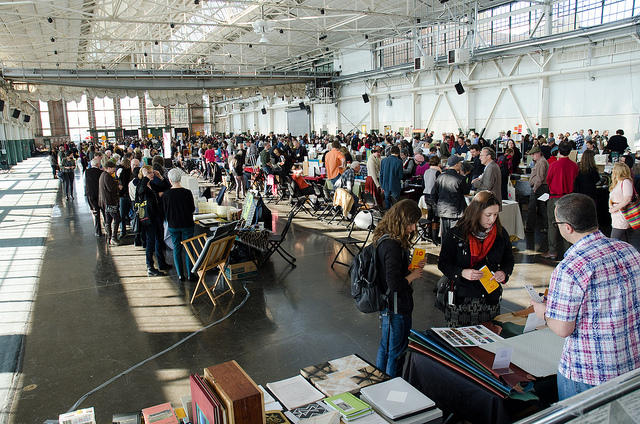 Managing a fair with niche interests has its challenges, namely a growing interest from both participants and visitors, which called for relocating CODEX to Richmond, just a ten minute drive from its original location. CODEX book fair detail. Courtesy of the Codex Foundation. Photograph by Karen Eng. 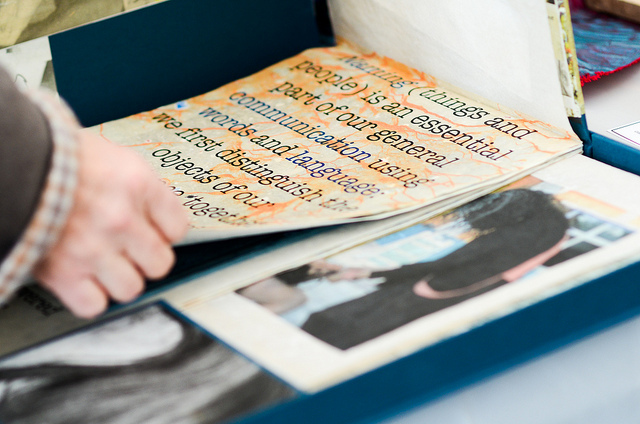 Likewise, the practice of making books can be as laborious as any other art form. Their construction requires specific tools and elaborate studios to house the delicate pages, let alone time and careful planning to ensure not only legible works, but works that can be viewed, read, studied, and collected. The privacy and intimacy of the book as art form carries with it a special relationship very close to the body. Where sculpture and painting are to be admired no closer than arm’s length, books require being held—each page turned one at a time to experience the linear paths laid out for the viewer or reader. So too the relationship with the maker and object is extremely intimate, small, and proportionate to the hand, the comfort of its structure dependent partially on the relationship that the reader gleans from sitting with it closely. Carolee Campbell, owner of Ninja Press, answered a few questions for me about her practice. LL: Your bio mentions that you studied kendo, which helped you realize that you love working alone. Do you make all of the work completely alone, or do you have both an individualistic and a cooperative process? CC: In fact, although my bio mentions that I practiced kendo, it had little to do with the discovery of my love for working alone. It was the years spent alone in the darkroom working on my photographs. I began to see how working independently, away from the theatre and television group dynamic, allowed me to work up to as high a level of creativity as I was capable. Also I could work as long and as hard as I wanted without having to wait to be cast in a production. As an actor, you’re only an artist when you’re hired to act. As a photographer/book artist, I can work 24/7, should I so choose. I work alone about 90% of the time. I design each book, set the text by hand in metal, print it, and create the additional artwork alone. I design the book structure as well. I bind the entire edition alone for the most part. I have some help once a week, if that much, on some of the binding steps. 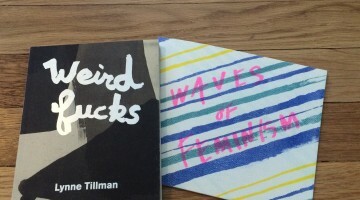 LL: Your focus is on poetry, which makes me think of the artist Richard Tuttle whose work is often equated with poetry. He said in an interview that his language leaves him when he makes art, but for you the books that you make are language and poetry . . . I guess what I am curious about is the poetry of making the book, as opposed to poetry as material and content of the book. CC: I don’t think there is “the poetry of making the book,” as you suggest. Making a book is a skilled craft using techniques that are honed in the practicing of them. The poetry I choose to build a book around is poetry that I want to explore in a much deeper way than by simply reading it. I explore it in the making of the book, from my initial ideas, to the right book structure, papers, type style, and artwork that closes in on the heart of the poetry to me. And that’s important. The book becomes my expression of that poetry. If I’ve done it right, the book becomes greater than the sum of its parts and offers a tactile expression/experience of the poetry it contains. I would say my books contain poetry in a singular setting; one I have evoked through materials and artwork. It is my hope that the reader will find both the poetry and the book they are holding in their hands likened to a single arrow striking the center of the target. CODEX book fair books. Courtesy of the Codex Foundation. Photograph by Karen Eng. LL: Could you please describe the collaborative nature of your work? Perhaps share an example you are excited about. ap: Our latest book Circle is a collection of phrases and images related to the circle that we made for our friends from Circle Gallery in Tokyo. The word “circle” comes with many meanings or ideas that we have tried to capture here. So we collected phrases and pictures and asked for our friends to draw and paint on the theme of the circle. It was very exciting to edit all of them. Also the idea for the binding came from that. CODEX will be the first fair outside of Japan that ananas press has participated in to show their work, and to see in person many of the presses from the United States that they have become familiar with. 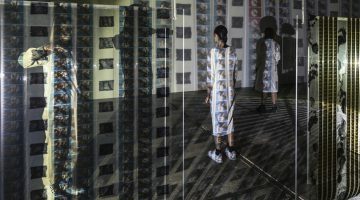 In this way, the fair becomes not only a place where artists and printers can show their work, but where they can build new circles of people from around the world to collaborate with, trade, and support each others’ work. In the last nine years the Codex Foundation has expanded its collaborations and affiliated initiatives outside of the Bay Area to include CODEXMexico and CODEXAustralia, each holding book fairs, exhibitions, symposiums, and more in Mexico, Washington, DC, and Australia. Their board is comprised of directors and advisors from London, Paris, The Hague, Mexico, Canada, and the United States. As with any important fair, CODEX offers a scholarly Symposium each year with noted historians and book artists from around the globe. For the last two biennials they have produced a catalog of the fair, titled Book Art Object. 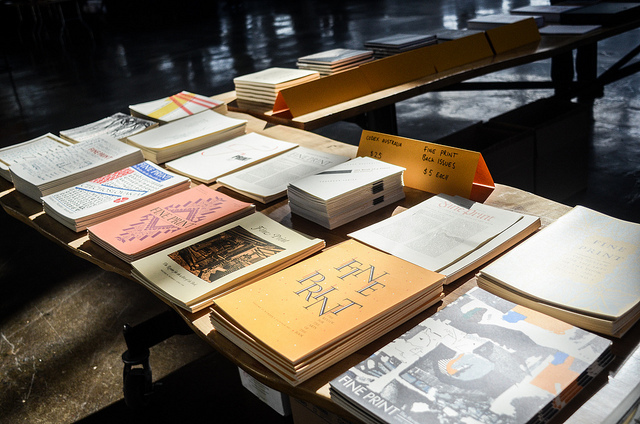 This year, Book Art Object 2 includes over 1130 images of 300 books by 140 artists or printers and a selection of critical essays from the 2009 and 2011 third biennial Codex Book Fair Symposium. Essays include Publishing artist books in France today, by Antoine Coron, Head of Special Collections, Bibliothèque Nationale de France; The role of the book arts in a 21st-century research library, by Richard Ovenden, keeper of Special Collections and Associate Director, Bodleian Library, Oxford; and Presses in Mexico, by Juan Pascoe of Taller Martin Pescador of Michoacan, Mexico City. The lectures this year will be on February 9th & 10th at Anna Head Alumnae Hall, 2537 Haste Street in Berkeley (between Bowditch & Telegraph). Click here to register for the symposia. You can listen to a series of MP3s of the above mentioned lectures and others from the 2011 symposium, such as Paul van Capelleveen, Curator Modern Collections with the lecture Changing Books: Friends and Enemies of the Contemporary Dutch Fine Book. and Martha Hellion, Artist & Independent Curator’s lecture, Perspectives : The Artist Book in Latin and South America. 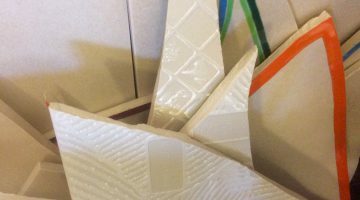 Also available are artists’ lectures, such as Didier Mutel of Atelier Didier Mutel, Paris, France and Caroline Saltzwedel of Hiruno Press in Hamburg, Germany. Each year they also produce a monograph series titled CODE(X). The monographs are $25 each and are handsomely printed with bold Constructivist style and modern text covers that include essays and illustrations. Marinetti’s Metal Book by Vincent Giroud and Visionaries & Fanatics: Type Design & the Private Press by Russell Maret look particularly enticing. CODEX is an industrious undertaking for the passion of books and Koch’s desire for elevating its form. Again citing the 2006 Milroy interview, Koch proclaims: “There must be the addition of the spirit at risk—taking risks that, when successful, will generate a spark that illuminates the human condition in all its horror and its glory . . . When a traditional craft is no longer employed creating meaningful and/or useful objects and the actual practice is not enjoyable in itself—then who would mourn its passing but some idiosyncratic historian. But, obviously, such is not the case with letterpress printing or books in general.” Yes, obviously, as book fairs thrive for their ever growing audiences, it is clear that print is not dead, and there is nothing to mourn, but instead objects to read and to touch. Both the Book Fair and Symposium are open to the public. Tickets: can be purchased at the door. SUN. FEB. 8: 12:30 – 5:30 P.M.
MON. FEB. 9: 12:30 – 6:00 P.M.
TUES. FEB. 10: 12:30 – 6:00 P.M.
WED. FEB. 11: 10:00 – 3:00 P.M. This year’s Symposium features two key note speakers: Roberto Trujillo Special Collections, Stanford University, and Alberto Manguel, Historian, Novelist, and Essayist. 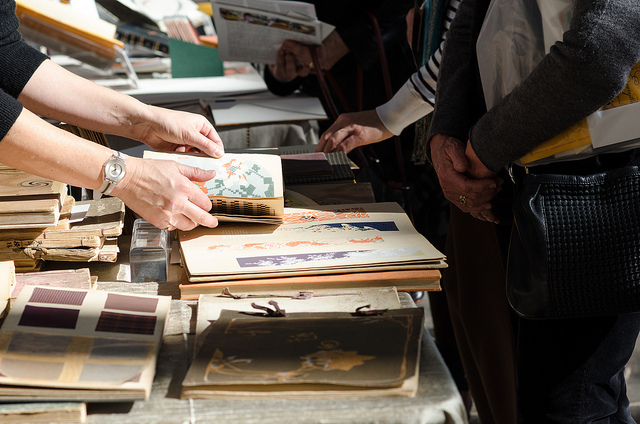 The CODEX Book Fair and Symposium is part of Rare Book Week West, which is a collection of fine art and rare book events taking place throughout the Bay Area from Feb. 5-13, 2015. Next post Visual Essay on Material Art Fair 2015, Mexico City.